If Beagle 2 had landed on Mars successfully, could it have discovered life? Manyspace missions use robots to explore. The rovers Spirit and Opportunityare still travelling around Mars, taking pictures and digging in the dirt. Butcould a robot identify alien life? How would a machine know the difference, forinstance, between a rock and bacteria? Hopingto answer this question, a group of scientists led by Derek Pullan of the University of Leicester used robotic explorer instruments to examine rocks here on Earth. Tomake their tests as realistic as possible, the researchers collected rocksamples similar to what we'd find on Mars and then studied them with high-techequipment. 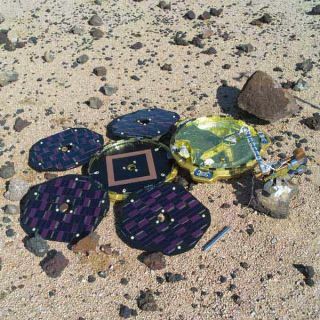 The instruments — which included a camera, microscope, and samplingdevice — were very similar to those carried on the lost Beagle2 probe. Theidea was to see if the instruments could detect signs of living creatures inthe rocks. Although the tests were carried out in a lab, the scientists madethe conditions as close as possible to those experienced by probes on the martiansurface. Allof the instruments tested were good at finding signs of life. The interestingresult is that they were much better when used together. This shows howimportant it is to not cut corners when building robotic explorers. To get thewhole picture you need a wide variety of instruments working together. TheBeagle 2-style microscope was found to be particularly good, showing thatlow-budget equipment can be as effective as expensive options. The team alsogot useful data about how close in proximity to a sample rock particularinstruments should be in order to spot signs of life. Sowhy is this research important? Space exploration may be exciting but it's alsodangerous and expensive, which is why robotic probes are sent instead ofpeople. But the problem with robots is they must be light and compact in orderto fit easily into a rocket. They also must be energy efficient, since theirpower is mostly generated from solar panels. This combines to make designinginstruments for them very difficult. Forexample, you might think that a robot exploringMars should have the most powerful microscope available. That's probablynot possible as everything must be low-weight, small in size, need little powerand also be very tough. Clearly instrument engineers have a hard job, and thescientists wanted to see whether the current equipment is up to the task. Morestudies like this are planned for field experiments and sample preparation, aspart of the Planetary AnalogueField Studies Network. The research is useful not only for instrumentdesigners, but also for mission engineers and planetary scientists. Theteam plans to do further tests with different equipment, building up a databasethat will show which instruments are best in any given situation. It all goestoward helping make future missions to Mars as effective as possible. Indeed,if we do find life on another planet, the discovery will be likely made by amachine and not a human. Theresearch is detailed in a February issue of the journal Astrobiology.